It’s pretty cold in Vegas, fall is finally upon us. I just wanted to be comfy and cozy plus I wanted to play with color. I decided to pair my new striped cardigan with a green tee I bought in March specifically to avoid being pinched on St. Paddy’s day. 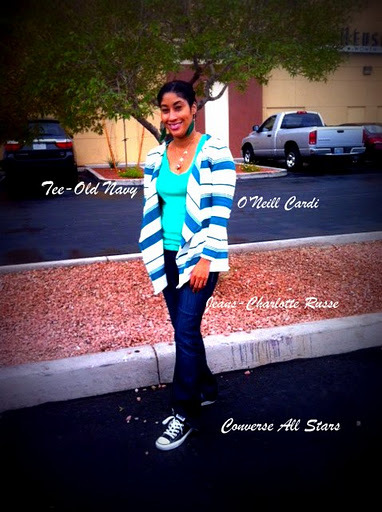 I also wore my boot cut jeans from Charlotte Russe and my trusty black converse. To liven things I wore green feather earrings I bought for a rave party and a fun necklace. By the time this picture was taken the weather had gone from chilly to freezing. the wind was out of control and it was drizzling. This was the best shot wear my earrings and cardigan were not blowing out of control.